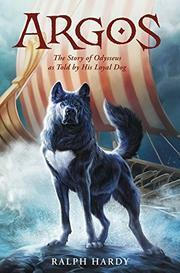 The epic tale of The Odyssey is told from the point of view of Odysseus’ faithful dog, Argos. Argos is left behind on the island of Ithaka to protect Odysseus’ wife, Penelope, and infant son, Telemachos. Over the 20 years of his master’s absence, he pieces together Odysseus’ quest to return home via reports from various animals that visit the island. Sea turtles, ravens, gulls, and even a nasty stray cat all relate the stories of the cyclops, Calypso, and the sirens to the faithful dog. However, even as he yearns for Odysseus’ return, Argos must fulfill his charge. As he finds ways to thwart Penelope’s devious suitors, Telemachos’ unscrupulous tutor, and a violent pack of wolves, Argos also finds time to fall in love. While Argos is noble and his view of his family is intriguing, the device that finds Argos and readers receiving the unarguably epic events second- and thirdhand is problematic. Dark magic, fantastic creatures, and god-sized temper tantrums lose their energy in this disjointed telling. Only the events in which Argos is physically present compel.